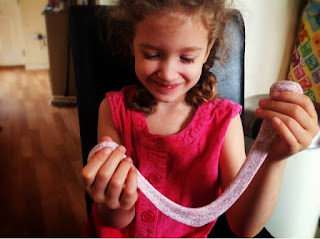 An Ordinary Life : Summer snow and how to experiment with it! 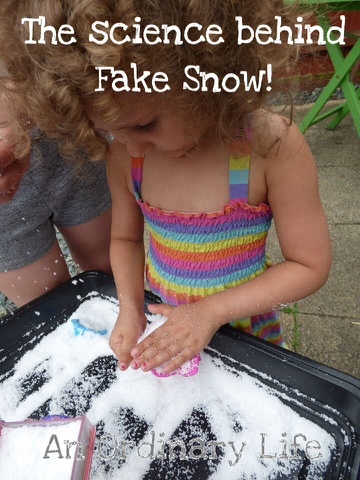 Summer snow and how to experiment with it! I call it summer snow, simply because it's a perfect activity for summer. This is a great bit of sensory play and one that's super for the summer because it cools you down; the chemistry between the water and sodium polyacrylate creates an endothermic reaction! Also watching it grow stirs up excitement and then, due to the fact that it's non toxic properties kids can play for hours with it! It's a great way to cool them down on a warm summer's day! And when you're finished, experiment more or give it to the plants: it's great for plants as when the soil dries out they soak up the water in the sodium polyacrylate. It's often used in gardening. It can also be found inside baby nappies! I know, but this stuff is clean, so there'll be no wee!!! And the reason why it's used like this is sodium polyacrylate is able to soak up as much as 200 to 300 times it's original volume in water! The chemical reaction that occurs when this happens is an endothermic one which is what gives it the cool snow effect. OK. You could use it all at once but this is how I do it to make it more Scientific! Put 30ml of sodium polyacrylate into a plastic cup. Add 100ml of water to the cup... Watch it grow. Ask how many more 100ml of water you would need before it's fully saturated. Add another 100ml or 50ml. You chose. Is the snow at it's fluffiest. If you add too much water, the snow will go slushy. If you want to bring it back add some more sodium acrylate. Experiment to find the perfect ratio but I have found it to be 1 part sodium polyacrylate to 3 parts water. Want to melt your snow? Add 5ml of salt, normal table salt and watch your snow melt! Well it looks like it's melting. What is actually happening is the salt is breaking down the superabsorbent polymer and releasing the water. Want to make things cooler? Put your fake snow, when it's made to perfection, in the freezer for up to 8 hours. It will feel even more like real snow! Make a snowman! Have fun and come back to An Ordinary Life when you fancy another fun Science activity to try!! This chemical we are using is known as a polymer. A polymer, by scientists, is defined as a long chain of molecules, looking very similar to spaghetti if you want to visualise it. Poly means many and mer means unit. This is because polymers are made of many units. They have stretchy elastic properties! Plastics are polymers as if SLIME and gels!